Children, Teenagers & Adults Welcome! 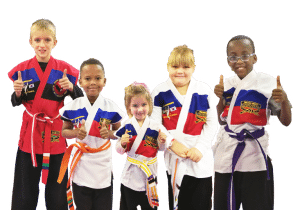 Children learn karate in a safe and enjoyable environment at Master West’s classes. We teach the internationally renowned Melody Shuman’s SKILLZ programme for kids, which focuses closely on each child’s progress. Our taekwondo and kickboxing classes for teens and adults are both formal and informal, and is conducted in a comfortable environment. We enter provincial, national and international competitions and have world champions training at our academies. Are you ready to acquire combat skills taught by the best? Are you or your kids unsure if martial arts is the way to go? Head over to our Class Times page and see what’s available and convenient for you. Most Popular Kids’ Activities in 2017 in Pretoria!